The adhesive bandages that you'll find in this section are are not your drug-store ordinary band-aids! For example, Coverlet Bandages. 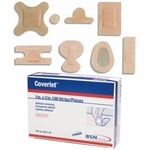 Coverlet Fabric Adhesive Bandages are made to absorb liquid faster than any competitors bandages tested by BSN Medical. The elastic fabric is latex free and moves with your curves and contours. Available in 11 shapes and sizes for a perfect fit. 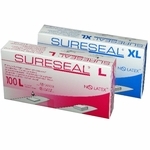 SureSeal Dialysis Pressures Bandages are used by dialysis centers worldwide as a post dialysis wound dressing. The SURESEAL cellulose pad expands to several times its original size on contact with blood. 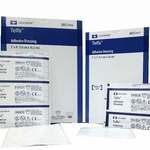 It can reduce pressure time over the traditional tape and gauze plus seals and isolates the site securely on all sides. 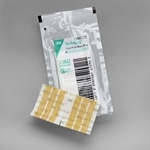 SURESEAL Dialysis Bandages are versatile and may be used on most venous and arterial dialysis and blood sampling sites.